Helloo! I am currently in our room here in Utah wrapped up in a fluffy robe and sitting on the carpet in front of the fire. I never want to leave. But, by the time you read this I will be home and trying to make the most of my last days of winter vacay. I’ll be heading to Massachusetts for a New Year’s reunion extravaganza, but other than that I will be spending my days lounging at home, watching movies andnotdoing the homework and SAT work that I really should be doing. 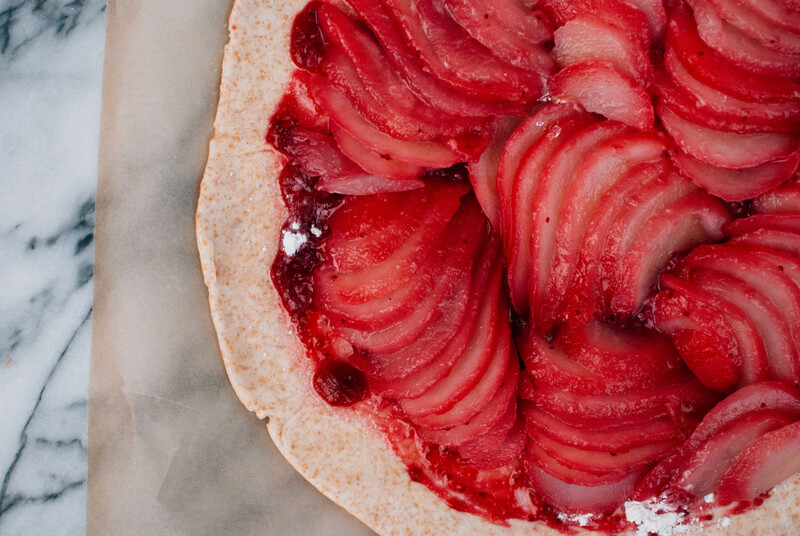 Because I’ll be at a friend’s house this NYE, I won’t be baking anything special… but if I were it would probably be this pear and cranberry galette I made a few weeks back. It was inspired by Yossy Arefi‘s gorgeous new book Sweeter Off the Vine, which is a collection of recipes using seasonal fruits. 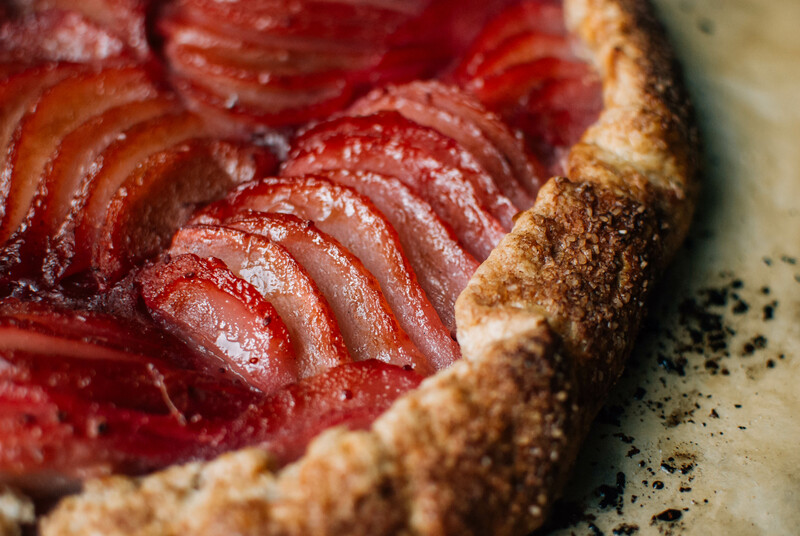 I took her spelt quick puff pastry recipe and paired it with sliced pears that had been simmered in a mixture of cranberry, vanilla bean and sugar, giving them a beautiful deep red hue and adding a bit of tartness. This recipe is super easy and all of the components can be made the day before (and stored in the fridge), making it perfect for a party. First, make the dough: Combine the flours, salt and sugar, then add in the butter. Use a pastry blender to cut the butter into the flour until the mixture resembles coarse crumbs. Add the water and mix until evenly distributed (it may still be super crumbly, but don’t worry about it). Turn the mixture out onto a lightly floured surface and knead it together into a rectangle about 1 inch thick. Using a bench scraper, fold the dough like a letter: first fold the right third of dough into the center, then the left side. Turn the dough 90 degrees to complete the first “turn”. Pat the dough down to 1 inch thick again and repeat the turn process 2 more times. Wrap the dough in plastic wrap and chill for at least one hour. Unwrap the dough on a lightly floured surface and roll to a 1/2 inch thick rectangle. Complete 3 more turns, then wrap the dough and chill for another hour while you make the filling. For the filling: Split the vanilla bean down the middle and scrape out the seeds. Place the seeds, pod, cranberries, water and 1/2 cup granulated sugar in a pot and bring to a boil. Boil for 10 minutes, or until broken down and saucy. Peel and core the pears, then slice them in half lengthwise. Add the pears to the cranberry mixture, adding another 1/2 cup water if necessary to submerge them. 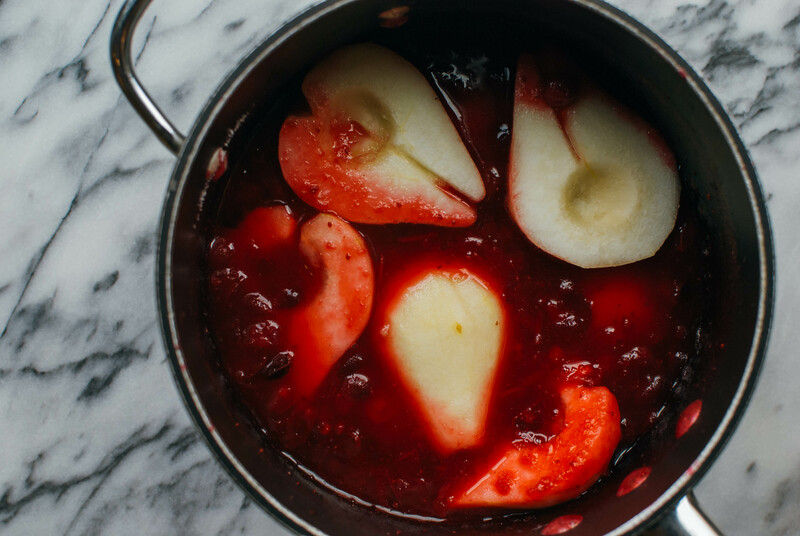 Simmer for 20 minutes, or until the pears are tender on the outside. 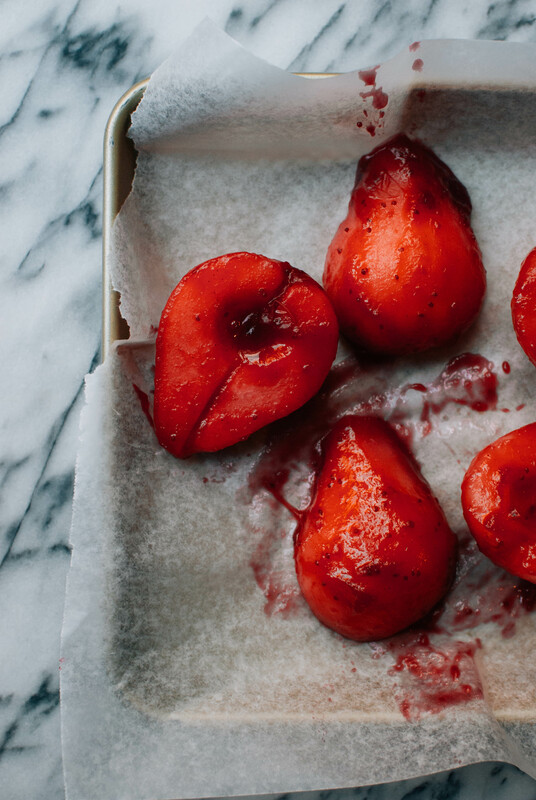 Remove pears to a sheet pan or wire rack to cool. Reserve the cranberry sauce and set aside to cool. Preheat the oven to 425 F. Line a baking sheet with parchment. Use a mandolin to slice the pears on the uncut side (so that you end up with slices that are half the width of a pear). Set aside. Roll the dough out into a 1/4 inch thick circle. Use apply a generous coating of the cranberry mixture (leaving a 1 inch border), then sprinkle on the 2 tablespoons flour and 1-2 tablespoons granulated sugar. Arrange the pear slices, then fold the edges of the dough over, pressing gently to seal. Chill for 15 minutes. 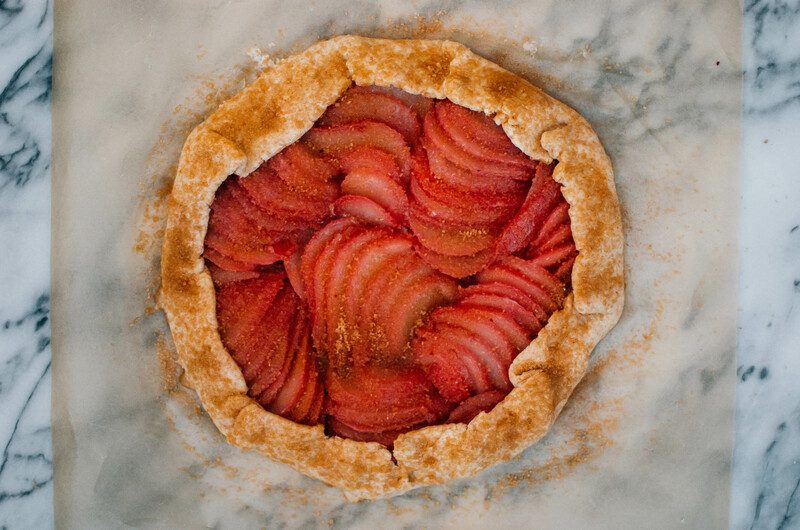 Brush the crust with egg wash and sprinkle with turbinado sugar. Bake for 30-35 minutes, or until golden and bubbly. Serve with vanilla ice cream!